I haven't blogged for a while, not on purpose and not for any particular reason...I'm a live blogger so unless there is anything to blog about I don't post. I have been trying to find the time for this update post since Wednesday though but haven't been able to get into it properly. I have had three attempts and deleted whatever I wrote, I found myself droning on and on when I really just wanted to get straight to the point. There are a couple of things really. she had but by the end of the course she didn't make a fuss at all about having to take it. 2) Milk - Martha has been on SMA High Energy since she was born, we've never questioned it and continued to order her repeat prescription. When Martha started eating after her last operation the Nurses all seemed surprised that we hadn't moved up a stage with her milk - but because no one has suggested changing it so we've just carried on. But her Milk is not her main diet anymore, she has proper food for her 4 meals a day and only has a bottle at Breakfast and Bedtime. We decided that once we ran out of our current prescription then we wouldn't be ordering any more and would buy Cow&Gate for 2-3 year olds. Her first bottle was made up for her on Thursday morning and she has been less than impressed. I can't understand why - I think the Cow&Gate tastes so much better than the SMA High Energy. Other than that it's been a pretty normal week; we've been watching the Spice Girls firm - A LOT, Daddy's been working, Osh and Isabella have been to school and Martha Grace went to Ti a Fi on Friday afternoon. I don't mind quiet weeks like this, especially when we thought we would be at GOSH still. 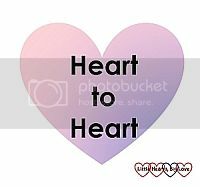 This month I've linked up with Louise from Little Hearts, Big Love for her Heart2Heart linky and I'd love it if you could pop on over there to support the other Heart Parents who share their stories there. I hope you're all having keeping safe from these high winds and the rain.